From seniors, disabled, obese people to autistic children, a tricycle has been an awesome partner helping riders live the happiest and most meaningful life possible. With this positive spirit, we’re counting down the top 9 best tricycles for you and your loved ones. Read on to find out more! How many speeds do you want for your trike? Do you want to spend time assembling your trike? Do you need your trike to be foldable? 1. What is the best tricycle? 2. How much is a three-wheel bike? 3. What is a trike bike? Schwinn is a truly American brand with a legacy of over 100 years that you can count on. 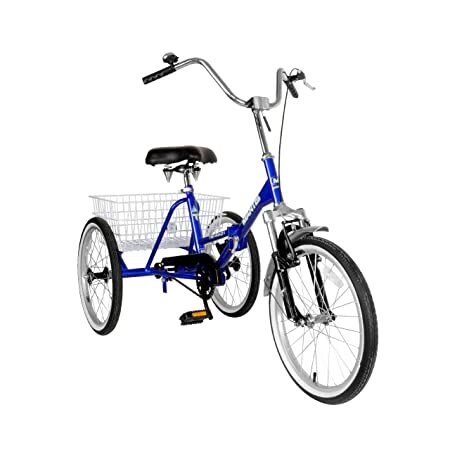 This Meridian tricycle right here is one of America’s favorite full-size trikes. It features two 24-inch wheels. What we love about this model is its stand-over aluminum frame. There’s no top tube, but only a down tube that shapes like a fish hook. This makes it super easy for riders to stand over the trike however they like. You’ll also love the huge rear fold-down basket. It can hold up to a week’s worth of groceries. If you find the groceries’ bags flimsy, we recommend getting one of those Sterilite storage bins. A 5-gallon bin would fit into the basket perfectly. Folks with mobility challenges love this trike because it’s so easy to ride. They can balance easily on the trike. It doesn’t cause them any dizziness. Many find this a great exercise and some have even lost some weight by riding the trike. Lastly, you don’t even need to assemble it because it comes fully assembled. We’re stoked to recommend this model to you. It would fit teenage to adults nicely. If you want some more trike power, check out the 26-inch model below the pros and cons! Upgraded with bigger wheels compared to the 24-inch Meridian, this trike can take up to a massive 400 lbs. The seat is properly padded with dual springs to absorb shocks and bumps. It’s also very comfortable to sit on even for long hours. You won’t get any back pain or soreness after riding. At the crankset, you’ll find a protective chain guard. This is to protect you or your loved one from that painful “Ouch!” when you accidentally hit your ankle against the chainring. Also, it prevents you from getting your pant cuffs caught into the cog teeth. Riding this trike is also very easy. They already installed and tuned everything before shipping it to you. So, it’s pretty much ready to ride out of the box. You’ll find 2 hand brakes on the handlebars. Due to U.S. safety regulations, all bike and trike brakes work in the same manner: Left Front – Right Rear. To stop the front wheel, squeeze the left brake and vice versa. If you’re unsure, follow the brake cable to see which wheel it’s connected to. And stopping the trike will be as easy as squeezing a lemon. This 26-inch model would be great for taller and heavier riders. It can never fail you. We recommend this trike right here. 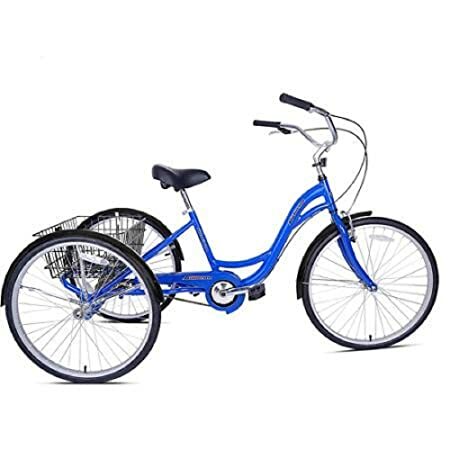 This trike is another great selection from Schwinn. If you’re looking for a fun way to lose some pounds, this is the trike that can help you out. It can hold riders up to over 400 lbs. Plus, it’s super easy to ride. You’ll not only get better physical health, but your mental health will also improve. The trike provides a fantastic outdoor exercise that’s fun and easy. Also, this is a single speed trike. If you’re not very familiar with the technical or mechanical parts of a bike or trike, a single speed trike means the trike only has one-speed control. That is, you don’t have to change gear because there’s only one gear on the trike. This makes maintenance super easy and headache-free. Also, the overall trike is lighter. The only point that we felt Schwinn could have done to make this trike complete was fully assembling it before shipping. Yes, you do have to get your hands dirty and do some assembly job. So, that’s a minus for us. Other than that, this trike is definitely worth the price. You’ll have a great time riding it. And you’ll be on your way to better health and enjoying life even more. 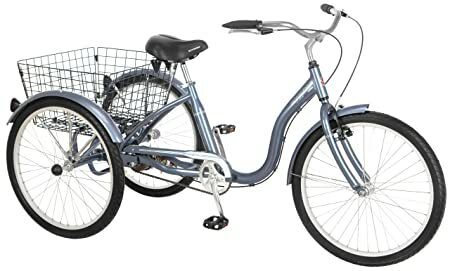 While all of the Schwinn models we’ve seen so far are 1-speed trikes, this Komodo trike has 6 different speed controls. There are so many unique things about this trike. Let’s first talk about its seat. We love that they made an extra padded backrest, connected to the typical seat with springs. This adds some extra support, especially for folks who have back problems. We love it! Did you notice those little orange pieces on the three wheels? It’s so nice that they have those as reflectors as well. It makes traveling in low-light conditions much safer for the rider. The gear system they use on this trike is Shimano RS45 shifters and Shimano TY derailleur. What this simply means is that you can change speed by just twisting the grip ends on your handlebars. Just like the throttle on a motorbike. Because this is a multi-speed trike, it will give you a lot of exercises. For example. if you change to a harder gear, it will be harder to pedal. You have to use more force then. We love that the packaging is very secure with lots of bubble wraps. However, what we didn’t like was the trike arrived with only 85% of the parts assembled. We think they could have gone an extra mile to have the trike fully assembled before sending it to us. Some folks find the assembly too much work. Others take around 45 minutes to complete. You can customize the trike however you like. Some riders completely replace the seat with a desk-chair type of seat for the ultimate comfort. Very creative! All in all, a great trike that can last for years. Ring ring! We think your children will smile a lot when they see this trike and hear the nice little bell sounds. You guessed it right, there’s a bell that comes with the trike. It’s not only fun to use, but it also makes riding safer for the rider. There are 2 wheel sizes you can choose from 20 and 24 inches. The 20-inch one would fit smaller riders, for example, those from 4’ to a little over 5’. And the bigger size would fit taller and heavier folks. What makes this trike special is that it’s foldable. You can easily collapse the handlebars, pull the Quick Release lever, and fold the trike in half. This is a huge space-saver. Not only that, you can easily put the trike into your car’s trunk or onto your van whenever you travel out of town. We think you and your loved ones are going to enjoy some fresh air, fun outdoor exercises, and have beautiful memories along the way. What we know for sure is that these activities will be great for your body and mind. It’s the greatest thing ever to see those around you happy. You may need to spend some time putting the trike together, though. If you’re not handy, take it to any local bike shops. Other than that, we give this trike 5 stars. The trike will not disappoint you! If you’re still in the search for a 6-speed trike, this model here may be suitable for you. 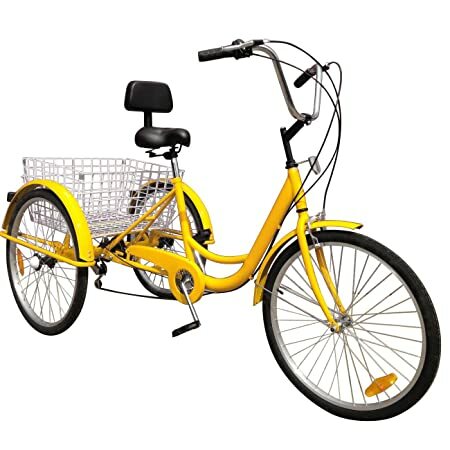 We like the yellow finish on the trike. It reminds us of those yellow cabs in New York. If we must describe this one, we’d say it looks like a combination of Schwinn, Komodo, and Tri-Rad. You’ll also get very good specs for the price. First of all, we like the added backrest. Then, the 3 reflectors are also nice. 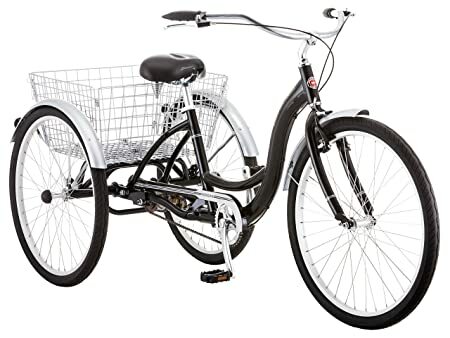 The rear basket is huge and can comparatively take up to a week’s worth of groceries like the Schwinn model. Also, we like that this trike is relatively lighter than the other trikes we’ve seen. They use Japanese Shimano RevoShift on this one. What you can do to change gear is to simply twist the grip toward or away from you. It’s super simple. What we, and many others, didn’t like about this model was the instruction manuals. In one word: Useless! While other trikes may take folks somewhere from 15 minutes to 2 hours to assemble, this trike may make them scratch their heads for 3 to 4 hours. And they end up saying, “I give up”. This is a major point which we think the bike maker should take note. We would love to see improvement in this aspect. 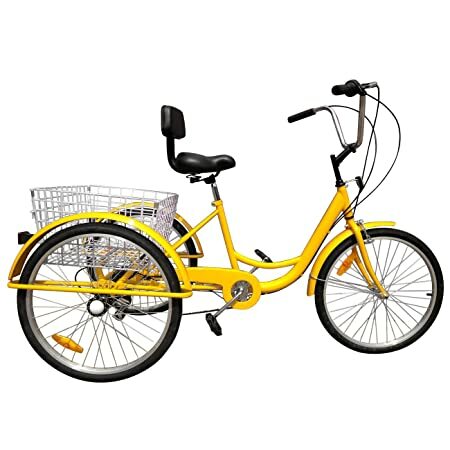 Other than that, the price is pretty alright and cheaper than other brands’ trikes. If you’re okay with all the specs, you can definitely give it a try. For now, we only give this 4 stars. When we see some improvements, we’ll give it 5. Maybe you’re thinking, “6 speeds seem too much, but 1 speed is too limited”. And for that purpose, we want to introduce to you this 3-speed trike right here. It’s the perfect sweet spot for your needs. Plus, Raleigh is an established brand in the bike industry with lots of happy customers. What we absolutely love about this trike is its rear basket. The design is very sleek and has perfect proportions. They coat it with black finish, which we think is pretty unique compared to the traditional silver one. The basket can hold up to 45 lbs. For us, this capacity is just about one weeks of groceries. Which is awesome! You don’t have to go through the headaches of choosing which size would be great for you. Because there’s only one size for this Tristar. It fits riders from 5’2” to 6’2” perfectly. If you’re 5’1” or 6’3” and wondering whether it will be right, don’t sweat it! A few inches won’t make huge comfort differences. You can adjust the seat to match your height. We would say this is the most beautiful trike in our eyes. The blue coating is very fun and pleasing to look at. Although it’s named Tristar (3 stars), we give it a full 5 stars for the construction, quality, and design. You’ll smile like a kid riding this trike! Closing our list is this Kent Alameda trike. This is a super simple and straightforward trike. While most trikes on the market today may cost you somewhere from $300 to over $600, this is a budget choice. It has all the good bits here and there. First, you’ll get a rear basket to haul your stuff. There are 3 fenders to guard your wheels against mud and dirt. Additionally, they use direct pull hand brakes on the trike. This is super simple to use. Squeeze left to stop the front wheel, and squeeze right the stop the rear wheel. A chain guard is also there protecting your feet from hitting against the sharp teeth. It can hold riders up to 320 lbs. Very supportive, indeed! To sum up, if you’re looking for a cheap trike that has acceptable features, this one right here is your best bet. The weight limit of trikes on the market today varies significantly depending on the model. The range goes from 180 lbs to over 400 lbs. The smaller models will be easier for lighter folks to control and ride. The bigger and stronger models like the Schwinn Meridian or Raleigh Tristar will fit heavier folks perfectly. The answer to this question is closely linked to your intention to use the trike. For example, if you want a trike as a means for losing weight or for cruising around town, then we recommend getting the 1-speed models. This will make maintenance so much easier for you because a 1-speed trike only has 1 gear. In general, it’s also lighter. 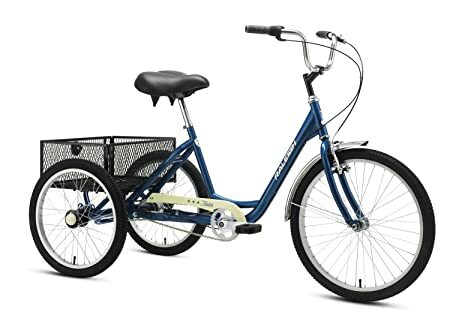 However, if you need a trike to handle inclines or other tough terrains like sand or grass, then getting a multiple speed bike would be great for you. On the market now, you’ll often find 3 speed and 6-speed models. If you like simplicity, choose the 3-speed trike like the Raleigh Tristar. If you like some more variety, choose the 6-speed Iglobal Buy trike. For most riders, we think it’s a clear no. 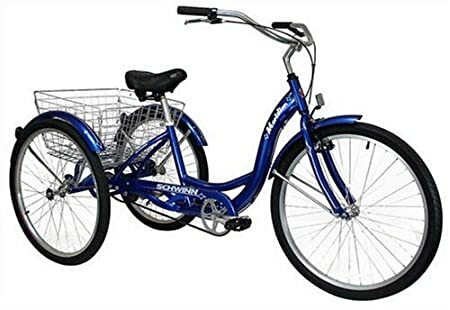 That’s why some models (like Schwinn Meridian) have the trike fully assembled before delivering it to your door. We also love this kind of quality service. Other folks, however, like tinkering with their trikes a little bit. For that, there are models that ship 85% pre-assembled like the Komodo trike. Also, don’t forget that you can customize your trike to your liking and needs. Some folks add a bigger seat for better comfort. Trust us, it would be a pain having to take your trike for servicing if anything breaks down during usage. It’s incredibly inconvenient if there are no bike shops in your local area. Manufacturers like Schwinn really stands behind their construction and quality. This is why they have a 5-year limited warranty and a lifetime warranty as long as you own the trike. You can check out more details on their website. If you’re unsure how long the warranty of your chosen model is, be sure to check with the manufacturer’s customer service. The paper instruction manual usually comes with the packaging, which most of the times would end up in the trash. Some folks lose it by mistake, which makes it super difficult to maintain or troubleshoot any problems with the trike on their own. Which is why you should check if the manufacturer publishes the user’s manual online. This makes it super easy to access from your phone or computer. Plus, you can show it to a professional if you’re explaining the problem to them. Usually, you’ll also find the model name, manufacturer’s help center info, safety guide, and many other quick troubleshooting tips in the manual. So, be sure to keep it handy for future reference. You’ll save a ton of money solving the problems on your own. If you just need the trike for riding around the neighborhood, then we think you don’t really need a foldable trike. 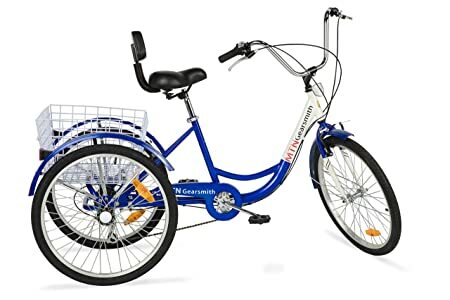 If, however, you want to have trips to other cities or states and would love to carry the trike with you, then a foldable trike would be a perfect choice. The best model we could find is Tri-Rad trike. It’s super quick and easy to fold the trike down in half. You can then place it into your car’s trunk easily. Be sure to use some straps or hooks to secure it so the trike doesn’t get any damages during the ride. We’d definitely go with any of the Schwinn models. Those are safe bets. Also, the Raleigh Tristar 3-speed trike is also good if you like some more speed variations. If your budget is rather tight, consider saving up for more or you can check the Iglobalbuy 6-speed trike to see if it suits your needs. Usually, you’ll find a three-wheel bike from over $200 to over $600 on the market today. The more expensive the product, the greater the support and comfort it has for the rider. Again, please don’t sacrifice quality for the price, especially when you’re buying a mobility device that could be with you for years. You get what you pay for. We’re sure you’re going to get this one in 3 seconds. When you’re ready, let’s count with us! A transporter with 1 wheel is called a unicycle, with 2 wheels is a bicycle (bike), and with 3 wheels is a … you’re right, a tricycle (trike).